Last night, Morgan and I went to see the new Cinderella movie. Now I need to make a couple of confessions. First, Morgan did not drag me to see the film. It was my suggestion. Yes I know it’s a princess movie. But I’m a bit of a film fanatic, I love Disney, and enjoy Director Kenneth Branagh‘s work. So sue me. Secondly, I actually enjoyed it. Granted, Cinderella does more dress twirling than I thought necessary and it isn’t a perfect film, but it features the right amount of charm and Disney magic that can make even the most cynical people smile. Even better, I haven’t seen a movie with so much Gospel truth in a long time. I highly recommend you (and your kids) watch it. While many moments stick out to me, I’m going to focus on just a few of them. Things might get a bit spoilery here, so consider reading this after watching the movie. That being said, most people know the Cinderella story and so the things below shouldn’t be too much of a surprise. The film introduces us to a young girl, named Ella. Like many Disney films, she loses both her parents. She is then left with her cruel Stepmother and two Stepsisters. They change her name from Ella to “Cinderella” because of the ashes on her face from all the serving work they force her to do. 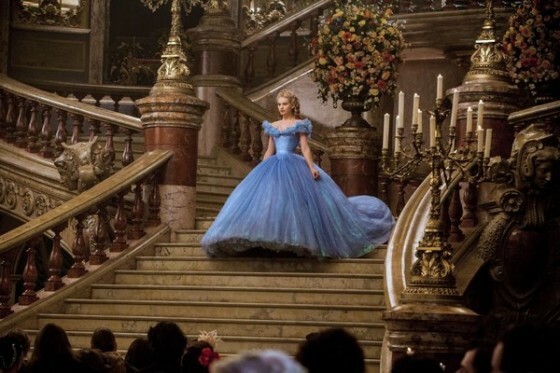 This identity stays with Cinderella throughout the movie. She frequently questions whether or not a prince could actually love her because she has so little to offer. This exchange works for Ella, who embraces her new identity as a princess, even if it is for just a few hours. As she walked up the stairs with a huge smile, I was struck by something. We are all just people, unworthy of the glories of God’s Kingdom because of our sin. Despite this, God chose to adopt us all as children, making us heirs in His Kingdom. When the clock strikes midnight, Ella runs for it. She is afraid that when the prince learns who she truly is, he will reject her. But this is not the case. Instead, the Prince searches the Kingdom to find the woman he loves. The prince is not deterred. He loves Cinderella for who she is and asks for her hand in marriage. And this is how Christ accepts us. We are tempted to believe that we need to offer God something special before he will accept us. We think “If I were a bit more holy” or “if I do more good works” or “once I start going to church more” then God will accept us into His Kingdom. But Jesus doesn’t ask us for good works or religious performance. He doesn’t require or money or our land. All he asks is for our heart. No matter where you are or what you’ve done, all you need to do is repent (turn towards Jesus) and believe (that Jesus loves you and can save you). If you’re a believer in Jesus, then those words are not just make believe. There is a Kingdom waiting for us all, and together we shall live with the King and truly know what it means to live happily ever after. Your turn: Did you see Cinderella? What did you think? Is it ok for a grown adult man without a daughter to enjoy this movie?